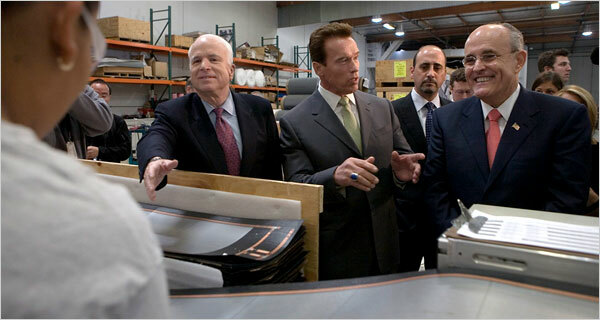 When Senator McCain visited California in February 2008 for the California republican primaries he pretended to support solar energy by receiving his endorsement from Arnold Schwarzenegger at a solar power manufacturing company in Los Angeles. What a prefect place to fool Californians, since we’re so pro-solar down here. Well the California republican primaries are finished and Senator McCain is changing his tune! The CEO of REI went on to explain that the company plans to install solar panels on their retail shops in Arizona, California and Oregon although there are no federal incentives to help with the costs. Then tell me why we give BILLIONS of dollars to big oil every year in subsidies? Is it because they are funding the McCain campaign? I seriously don’t understand this guy, hes from Arizona for Pete’s sake! There is an abundance of free energy falling from the sky everyday, and this guy is promoting nuclear power? Which is dangerous and could be used as a weapon in a terrorist attack! McCain needs to understand we need to follow the footsteps of the countries who have already established great energy polices and use renewable energy as a large part of their portfolio. Distributed energy is the future no matter if McCain is president or not, the people want solar power and solar power they shall receive!